Do a quick Google search of most hated vegetables, and okra pops up everywhere. I can understand why. Unless you grew up eating okra, it's an intimidating vegetable. Its outward appearance doesn't give you too many clues about how to eat it: Do you cut off the top? Do you eat it raw? How the heck do you cook it? When you finally conquer your fear and cut into okra, the round, white inner pods release a juice that can be best described as "slimy." For many people, the sliminess factor is enough to completely halt their okra eating experience. That's too bad, because okra has a lot to offer. In many parts of the world, slender, tapered okra is referred to as "Lady's Fingers," which is a much more charming name. Okra's texture is highly appealing. When cooked properly, it retains a crunchy on-the-outside, creamy on-the-inside quality that is uniquely satisfying. Its flavor is similar to green bell peppers, but earthier. Plus it's easy to cook, versatile, and healthy. How 'bout you? Do you love or hate okra? Why? 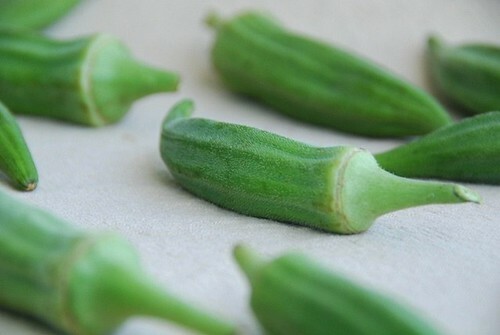 Here's a guide to selecting, storing, and cooking with okra. How do you select okra? Choose brightly colored green pods that are firm and sport a pale peach-like fuzz. Avoid okra that is bruised, darkened, or limp. Okra is available at most supermarkets year-round, though it peaks during late summer and early autumn. How do you store okra? Place whole, unwashed okra in a plastic bag, or wrap in paper towel, and place in the crisper drawer of the refrigerator for up to 2-3 days. How do you prepare and cook okra? Rinse okra well and pat dry. Cut off tops and discard. Although okra can be eaten raw in salads, most people prefer it cooked. Slice for stir-fries and gumbos, or keep whole if frying. Okra can be microwaved, sauteed, broiled, roasted, baked, steamed, and grilled. To reduce sliminess, add something acidic such as vinegar or tomatoes to the okra while cooking. Okra is most commonly found in hearty gumbos and stews. It's also wonderful in stir-fries with vegetables such as onions, red bell peppers, corn, and zucchini. It's most irresistible when dipped in buttermilk, then cornmeal, and fried to golden perfection, which is a delicacy of the American South. What are the health benefits of okra? Okra is a low-carb vegetable. 1 cup has only 36 calories, 0 fat, o cholesterol, 4 g carbs, and 2 g fiber. Okra is especially high in vitamins C and K, which help boost your immune system and prevent bone loss, respectively. Okra's characteristic sliminess functions as a natural, flavorful thickening agent in stews and soups. 1. In a large frying pan over medium high heat, warm olive oil. Add onions; saute 3 minutes, or until lightly browned. 2. Add chicken. Saute, stirring occasionally, for 5-7 minutes, or until browned. 3. Add red bell peppers, okra, and jalapeno. Saute 3 minutes. 4. Add diced tomatoes with juice, vegetable broth with cornstarch, cumin, and salt. Raise heat to high; bring to a boil. Lower to a simmer, and cook for 7-10 minutes, or until vegetables are tender but not mushy, and the sauce has slightly thickened. Remove from heat. Stir in fresh cilantro and queso fresco. Season with salt as desired. 5. Add 1/4 cup cooked grains to each dish. Top with 1/4 of the stew. Garnish with additional cheese and cilantro. Serve immediately. *Queso fresco, a mild flavored, soft Mexican cheese with a crumbly texture, is available at Mexican specialty markets as well as the refrigerator section of most major supermarkets. Cotija anejo, another mild-flavored Mexican cheese with a crumbly texture, is a good substitute and is also found in most major supermarkets. I've been drooling over the picture since you posted in on Twitter, and now I can't wait to make it! I tried to introduce okra to a few of my friends when I moved to Michigan (after growing up in Florida and Georgia). Some of them enjoyed it, but others couldn't get over their preconceived notions about okra. I suppose that means more okra for us! Gorgeous photo. I love okra which is called ochro in parts of the Caribbean where I am from. It is used in Callaloo soup, variations of which are popular all through the Caribbean . I'm a okra lover, either in soups or as you said, dipped in buttermilk, cornmeal and fried golden. 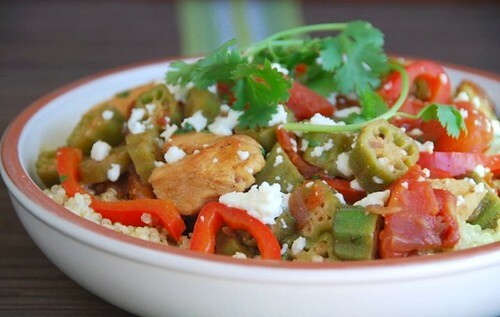 Your chicken and okra stew looks delicious! I have been a life long okra hater. I'm embarrassed to admit it. I eat every vegetable under the sun and love them all. Except okra. But reading this post I think maybe I will have to try it again. Wish me luck. Gag. I love to eat okra, and order it in restaurants (usually Indian restaurants), but I've never cooked with it...it's kind of hard to find! Oh god. I absolutely hate those slimey, gross, tasteless things. I live in GA and people go crazy over them. Fried okra is okay but by the time you deep fry anything, you lose the nutritional goodness of it. Love the sound of this. I admit, I've never cooked okra and have really only eaten it in gumbo. But would love to try. I haven't had okra for years - you have me craving it now. I've been eating okra since I was a little girl. I was first introduced to it by my southern grandmother. So of course my preferred recipe for Okra is fried!! I love it!! That dish looks so tasty and appetizing! I don't eat okra myself (not sure why... maybe it was the slimy-ness when I was a kid?)... but, I can appreciate the way that stuff inside makes certain soups and jambalaya thicker... so, I use it mainly for that purpose. I love okra, especially in sour fish soup and fish head curry (Asian style). Soo nice! Love your simple stew with chicken, too. yay for okra! I love okra! Of course, fried is delicious, but usually when I buy it fresh I simply saute it whole, maybe with a little garlic and jalapeno. This way it's not slimy. (I even posted a recipe for it on my blog!) Your stew, however, looks wonderful. I just bought some yesterday at the farmers market and was considering preparing it in a new way...this might just be it! Oh I love okra of all kinds even pickled. I tried growing it my garden last year but I didn't get enough of a crop to make it worth my time. My mom & dad always fixed okra, bacon & tomatoes while I was growing up and I love it to this day. Unfortunately Gorn is not a fan ... that just means I get to eat it all when I fix it. katie-That's so sweet! Thank you! You're so right, okra has a serious flawed image with most people outside of the South. wizzythestick-Oh, I'd love to visit the Caribbean to experience your amazing cuisine. italiandish-Gag. You crack me up. cate-Yeah, okra is an important vegetable in Indian cuisine. kayln-It's a great low-carb veg for you. mark-I'll keep working on it. pam-That's what I like to hear! danielle-That's what Southern grandmas are for! rosa-You should give it a try! lauren-Give it a second chance! patsyk-That's great that you can look past your bias and still appreciate it! anh-I've never had okra prepared in fish stew. I'm sure it's delicious. tastyeatsathome-I like it simply sauteed too. I'll have to come check out your recipe. Thanks for the link. My mother used to make a similar chicken stew with okra, and this weekend she tried roasting okra and highly recommended it - so that's now on my list. I love okra & in India it is a very popularly used vegetable, called by the "Charming name" Lady's Finger. I cook it very often, but usually stir fries or sauteed & then fried with caramelized onions & spices. They are also sometimes cooked in yogurt sauce. to reduce the sliminess, i usually leave them in a plate spread out for an hour or so, to dry it out.. also add the salt after it gets cooked as the salt releases more water. It is a lovely vegetable. I absolutely LOVE okra. I grew up eating it (almost always on its own or with a meat, stewed in tomato sauce) and it's one of my favorite veggies. My husband, who loves everything, is not the biggest fan, but he'll still eat it. This dish looks great! I really don't understand why folks hate okra. I hated veggies as a child. Okra and watercress were the only ones I would willing eat...go figure. I love okra and only just saw it in the farmers market this past Saturday. It's on my list for next Saturday. Okra is great tossed into a saute of other summer vegetables, especially if tomatoes are included. I love your chicken okra stew! I, for one, love okra, but I think it is because my mom knew how to cook it when I was little! I haven't made okra for my kiddos yet... should probably give it a try! I used to eat lots of okra back in Brazil, but once we moved ot US, it seems that is not such a popular item at the groceries...the dish that you feature looks yummie. You made okra sound great! I will admit, so far I've only been part of the okra-disliking camp but I'll consider trying it again! I L-O-V-E Okra in vegan gumbo!!Thanks! I am a huge fan of okra. A tip to reduce the 'sliminess' of okra is to bake it with little oil for 15-20 mins and then use it for whichever dish you want. It always works for me, esp the frozen okra. (becoz I am atimes lazy to cut it). I never see fresh okra - so I've had to buy it frozen to use in a recipe. I have made a Virginia classic, Brunswick Stew, which absolutely must have okra as an ingredient. People don't like okra? What's wrong with people? Love it. Thanks! I have of course never had the opportunity to try okra. I have seen it frozen on occasion so will keep my eyes "peeled". I haven't had it in a long time and when I did it was in a chicken gumbo soup from Newport Creamery. I think I would really like this stew! Actually I love vegetables but I only hate one, the okra. 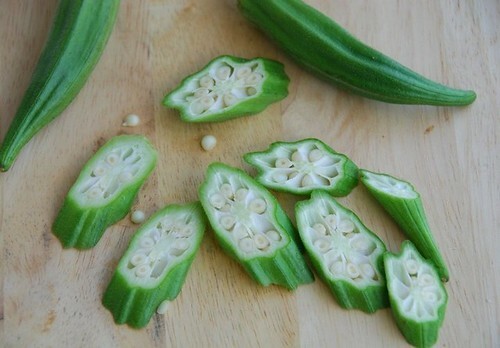 I don't like the taste of okra, but after I read this post I can't wait to try it. I think I will give the okra a chance to be one of my favorite. I have some favorite recipe from tanya's site http://vegetable-recipes.net/ try to visit it, I like them. Mmm I love okra. I guess I did grow up eating it, and Japanese people are really into the whole slimy vegetable thing, but it really is good! This is an interesting usage of the okra of yours. Does it give out the sticky liquid when it's chopped like that? kevin-Roasting sounds wonderful too. It's next on my list. soma-Those are great tips too! elly-At least he'll still eat it! veron-Okra and watercress? That's unbelievable! juliana-Yeah, it's most prevalent in the South. I know growing up in New England, we never had it. hilary-Yay! Okra deserves another chance! candy-I love okra in gumbo too! siri-I agree. Sauteeing it reduces the slime factor altogether. val-Yes, do! Fresh is so much better than frozen. annie-Newport Creamery had okra?! Whooda thunk? jayem-That's what I like to hear! bbb-Really? Thanks for letting me know! littleteochew-Oh, that's awfully kind of you. Many thanks! Sounds like a delicious combination! I like how quickly this comes together too. My grandmother made the BEST pan fried okra. I've never been able to reproduce it. Also, my stepmother makes really nice okra with fresh black-eyed peas (straight from the shell, not dried) and onions. It's really nice - not slimy at all. Okra & slimy juice, oh how appealing. I'm sort of late to the okra party...I'll admit that I tend to simply tolerate it in gumbo and the like, but I absolutely adore it deep fried. I'll have to give your recipe a try, sounds delicious! I could be wrong but I think I've only ever had okra fried, or in gumbo. I think I'll have to expand my horizons. Learning to eat okra has been an experience. But now that I know how to cook it, it can be delicious. Adding this recipe to my list. I love okra! I grew up eating it from my grandparent's farm. It's earthy and versatile and so good. Pairing it with tomatoes is still my favorite. lisa-It's super fast and easy! laura-Hope you do! It's healthy and delicious. sal-That's because those are the only two dishes most people can tolerate with okra! tealady-So glad to hear it. Thank you! brie-Mine too. Okra and tomatoes are beautiful together. I was so shocked the first time I cooked with okra and saw how well it thickened everything! Such a great ingredient! That's it. You've convinced me to give okra another try! Okra? Oops, never heard of it! anonymous-Yay! Happy to hear it. My friends from the Congo introduced me to Okra, they call it Dongo Dongo - I love it. Roasted okra is my favorite. Olive oil, salt, pepper, 350F for 25 minutes. I want to add some okra to gumbo. I've never used it before, any tips on how to avoid the slimey texture when boiling or adding to gumbo? Since it's a stew, you really don't notice the slimy texture anyway. Hope you enjoy it! I just made this recipe. I was searching for something different to do with okra after receiving a ton of it in our CSA box. This was DELICIOUS! My entire family loved it, even our 4 year old and 1 year old, but they love to snack on okra raw, so maybe it's not that surprising that they loved it. Thanks for the awesome recipe. It's a keeper! anonymous-Your 4-yr. old loved it? Yay! That's wonderful. I just started slicing it raw in salads too; it adds delicious crunch!